By joining our Cloud Email Backup Service, our cloud backup platform will automatically store your all incoming emails temporarily by switching DNS when your email server is breakdown or unable to connect. Cloud backup platform runs on a shared structure platform with a large number of server groups. It supports unlimited expansion which can cooperate with massive, advanced equipments that add in the future. Cloud backup platform will 24/7 non-stopping checking the operation of the email server to ensure backup function is able to run anytime. This gives you 365 days protection. 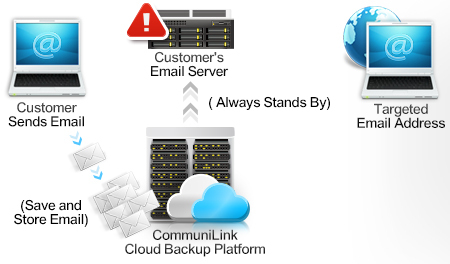 When your email server has any connection problem, the cloud backup platform will be your backup email server right away and ready for backup email. After that, the cloud backup platform will send back email to customers' email server when yours back to normal which ensure you can receive every important email. Cloud backup platform always in the best operating condition. 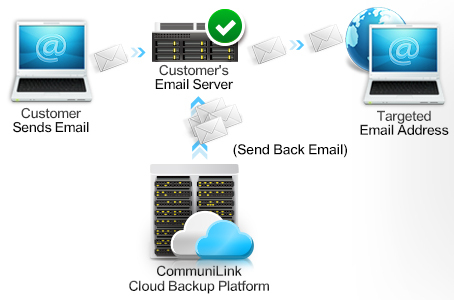 When there is breakdown or connection problem of email sever, backup email server will replace email server to receive and store emails while supervise the condition of customer’s email server. 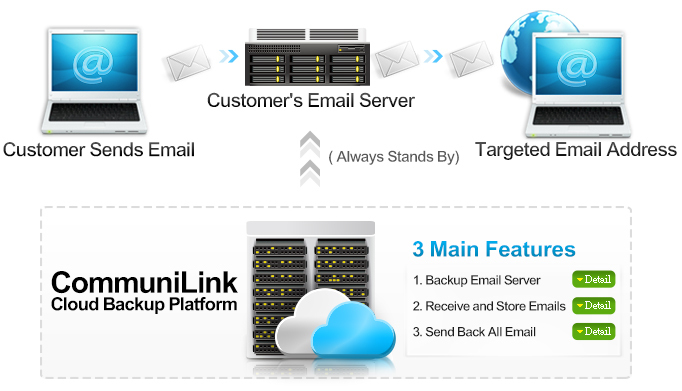 When email server backs to normal, backup email server will send all email to customer’s email server automatically. Thus, customer can receive emails that stored during the breakdown of server. Backup System can only store up to 2 days of email every time. If your email server still have not restored at that time, cloud backup platform will return email to sender that received 2 days ago. If email server setting of sender is not supporting sending to secondary email server record, then it is unable to store email temporarily. In order to give you more protection, we provide FREE spam filter that follows International Blacklists rules for your customers. Service setup process: Customer needs to provide MX record to CommuniLink. After we setup the cloud backup platform, we will provide the server record of cloud backup platform to you. Customer needs to inform your current server provider to update Second MX Record as server record of cloud backup platform. And it is done! After that, the platform will start to supervise the operation of customer’s email server.